Community members rally against the establishment of Rocketship San Pablo Elementary during the first public hearing for its charter petition at the West Contra Costa Unified School District board meeting on Wednesday, Nov. 15, 2017. Hundreds of teachers, parents and students turned up at the West Contra Costa Unified School District’s board meeting on November 15. The turnout was so high that seats prepared in the spacious multipurpose room at Lovonya DeJean Middle School were far from enough to accommodate the crowd on this rainy Wednesday night. However, most of them attended the meeting just to discuss and debate one short line on the four-page meeting agenda that read “initial public hearing for Rocketship San Pablo Elementary charter petition.” If the petition gets approved, it would be the first charter school in the city of San Pablo. Although charter schools may not have a positive reputation in West Contra Costa, they have grown rapidly in the district over the years. Eight charters were established in the last five years, and this is the third time a charter petition has been discussed and reviewed by the board this year. The previous, Voices College-Bound Language Academy and Invictus Academy of Richmond, were approved by the district’s board and the Contra Costa County Board of Education, respectively, meaning that there will be 14 charter schools in total operating in the district by next fall. Based on the crowd reaction and public comments made on charter school expansion at the meeting, many community members—teachers, parents and students—in the West Contra Costa Unified School District have strong opinions about charter schools and how they can affect district schools. Although the passion for having conversations about education is never a bad thing, it’s important to pause and process what has really happened in the district so far regarding the growth of charter schools and examine some of the financial activities and legislations that may have shaped the current charter school landscape. The last two board-member elections saw campaign contributions from organizations with strong links to charter schools. Currently, three out of the five school board members sitting on the stage received six-figure contributions from these organizations. Considering board members as district leaders not only set policy, but also review petitions and decide whether to approve new charter schools, a good place to start the conversation is asking questions about these campaign contributions. How much money was spent during last year’s West Contra Costa school board election, and who were the major players? Parent Teacher Alliance, an affiliated arm of the California Charter Schools Association (CCSA) Advocates, poured more than $340,000 worth of nonmonetary contributions to the 2016 West Contra Costa school board race to support Tom Panas, a retired public accountant, and district parent Miriam Sequeira, according to the Contra Costa County Elections Division. Based in Sacramento, the CCSA Advocates is an advocacy group dedicated to promoting the California charter school movement and electing public officials who support charter schools. Although Sequeira wasn’t elected, she received nonmonetary contributions from Parent Teacher Alliance with an estimated value of about $195,000. That amount is twice as much as the total money raised by other five candidates that ran but weren’t supported by the group. In addition, both Panas and Sequeira received about $16,000 worth of goods and services, including consulting, canvassing and communications, from New York-based nonprofit Students For Education Reform (SFER) Action Network. Apart from endorsing candidates in local elections, SFER also offers students training and paid fellowship opportunities to campaign for candidates supported by the group. During the last election cycle, student canvassers who participated in the fellowship program in Richmond helped encouraging local residents to vote for Panas and Sequeira, according to previous reports. According to campaign finance data compiled by the California secretary of state, SFER Action Network also contributed $8,700 in independent expenditures to the school board election in 2014, supporting Valerie Cuevas and Elizabeth Block to win two out of the three seat available in a ten-candidate race. The third major player involved was the political action committee of local nonprofit Education Matters. This group was founded by two local philanthropists, Steve and Susan Chamberlin, who donated $665,000 to Education Matters PAC in 2016, according to Contra Costa County Elections Division campaign finance records. The committee made about $73,000 and $15,000 worth of nonmonetary contributions to support Panas and Sequeira, respectively, and contributed $100,000 monetarily to both campaigns. And the committee not only donated more than $161,000 in independent expenditures to endorse Cuevas and Block in 2014, but $31,000 also was spent to oppose incumbent Madeline Kronenberg, who had publicly opposed admission policies and procedures of charter schools. public portal. Young received about $4,500 for her campaign, including $2,500 she loaned to herself, according to previous Richmond Confidential coverage. Education Matters formed a community endorsement panel to interview school board candidates ahead of last year’s election. The panel — which consisted of district parents, former students and education advocates from local nonprofits including the RYSE Center, the BlackBoard of West Contra Costa and the Latina Center — endorsed Panas and Sequeira. According to executive director Jason Singer, Education Matters only backed candidates who were endorsed by that panel. Carlos Taboada and Mister Phillips, a former attorney who was elected without support from Educations Matters and outside money, did not participate in the interview for endorsement. The Parent Teacher Alliance, Education Matters PAC and SFER Action Network injected about $472,000 into the 2016 West Contra Costa school board election, an enormous amount for a school board race, representing about 64 percent of total contributions received by all seven candidate during the election cycle. Some are concerned that such influx of investments can potentially affect future judgments made by the board. Kristyn Jones, a third grade teacher at Lake Elementary School and member of United Teachers of Richmond, was one of the many community members who gave public comments to oppose approval of the Rocketship charter petition. She has been actively involved in community efforts against growing establishments of charter schools in the district for years. Campaign finance records indicate that multiple architecture and construction firms played a significant role in the local school board race in the last decade. The Seville Group Inc. (SGI), one of the major donors, is a construction management firm based in Pasadena. Since the 2006 election cycle, it has spent more than $100,000 to support five different candidates in competing for seats on the West Contra Costa school board. Kronenberg, current chair of the district’s facilities subcommittee, received $42,500 from SGI for her three campaigns in 2006, 2010 and 2014 in total. 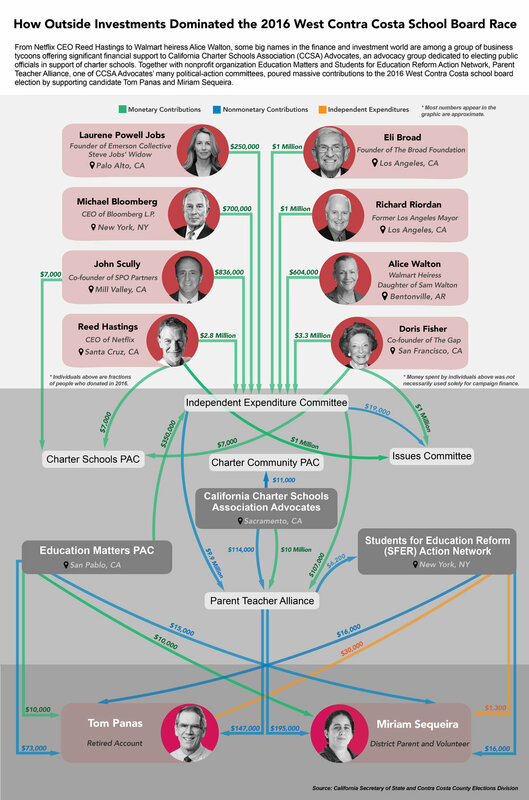 The California Charter Schools Association sits at the core of a complex ecosystem, comprised of multiple political action committees under its umbrella and other players such as SFER Action Network and Education Matters PAC. Money and various services were shuffled from one entity to another, and the contributions eventually flooded the West Contra Costa school board race. For instance, apart from investments in the West Contra Costa school board race last year, Steve and Susan Chamberlin collectively donated $450,000 to Charter School PAC, an arm of the CCSA Advocates primarily focusing on state senate and assembly elections. Education Matters PAC also contributed $450,000 to the CCSA Advocates’ Independent Expenditure Committee in 2016, according to the California secretary of state. The Independent Expenditure Committee is one of the main contributors to Parent Teacher Alliance, but it’s also the arm that acted as a gateway, so that outside investment could flow into the system. A series of well-known names in the world of finance and investments appeared on the list of donors behind the CCSA Independent Expenditure Committee. Doris Fisher, co-founder of the clothing brand GAP, topped the list by donating about $3.3 million in 2016. Behind the San Francisco-based philanthropist was Netflix CEO and co-founder Reed Hastings, whose lesser-known title is board member of the CCSA, contributed approximately $2.8 million. Former Los Angeles Mayor Richard Riordan, who publicly endorsed charter schools, was also on the list by spending about $1 million to back the Independent Expenditure Committee. The 87-year old Republican was heavily involved in the multimillion-dollar Los Angeles Unified School District school board race earlier this year, which turned out to be the most expensive school board race in U.S. history. Although millions of dollars entered the system as monetary contributions thanks to these individuals, it’s unclear if their investments were directly spent on campaign finance or other activities. The CCSA Advocates did not respond to request for further information. Bruce Fuller, professor of education and public policy at the UC Berkeley Graduate School of Education, has done extensive research on charter schools in the Los Angeles Unified School District. According to Fuller, charter advocates are trying to offset contributions from union leaders with these donations. “I think they have an argument that since the 1970s when teachers won collective bargaining rights, the unions have had a disproportionate and non-democratic influence on school board.” Fuller said. Does all this outside money impact decisions made by school-board members? During the public hearing of the Rocketship charter petition, several individuals in the crowd held up signs demanding board members who benefitted from organizations linked with charter schools be recalled. High-dollar investments pose the question of whether schools board members, as public officials, can be impartial while making judgments and decisions, especially when it comes to charter schools. But much of the complexity stems from the legislation regarding charter schools in California. According to board member Panas, approving or denying the charter petition is the only decision the board makes about a charter school. The law that Panas refers to is the California Education Code Section 47605, regarding the establishment of charter schools. It states that the district school board can only deny the petition for starting a new charter school for five different reasons. According to Dr. Linda Delgado, the district’s charter oversight coordinator, two of the reasons are straightforward: The petition should have enough signatures and contain an assurance of a few conditions listed in the statute. In order to make judgments on the other three reasons, board members have to determine whether the charter is an “unsound educational program,” examine the practicality of the petition and decide if it comprehensively describes various aspects of establishing a charter school ranging from governance structure to annual goals. Education Matters sent out questionnaires to participating candidates before the community endorsement panel interview last year. When asked about the vetting process of reviewing a charter petition, Antonio Medrano and Don Gosney, two candidates who were publicly against the growth of charter schools, both acknowledged that the law on issuing charters should be followed. But with judgments come varying interpretations of the regulation and outcomes for submitted charter petitions. However, the board approved it months later for a five-year term, starting from the next school year, in a 4-1 vote, with Phillips being the only one to oppose. According to the same legislation, once denied by the local school district, charter petitioners have the right to appeal to the county board of education, and to the state if necessary. After the board denied Invictus Academy of Richmond Charter in July, for instance, the petitioners took it to the Contra Costa Board of Education in September and received approval. Previously, three charter schools in the district — Making Waves Academy, Summit K2 and Caliber: Beta Academy — were granted approval from the county level after being initially turned down by the district board. Carlos Taboada, former teacher at Richmond High School and one of the candidates who ran for school board last year, believes that the charters should be given the opportunity to appeal. “If they [board members] see a large crowd and former school board member denouncing them. They’ll deny the petition knowing full well that it will be approved by the county,” Taboada said. Panas, on the other hand, argued that keeping the opportunity to appeal can reduce political forces’ impact on judgments. According to Fatima Alleyne, Contra Costa County Board of Education member who supervises parts of the district, county board uses the same criteria to judge a charter petition based on the Education Code. The catch is that, once a charter school is approved by the county board, it’s the county’s responsibility to supervise it not the district’s. According to Delgado, having a charter supervised by the county also means that the district would lose the oversight cost to the county, which is up to 3 percent of the revenue generated by each charter school. Panas said the students in these charter schools would benefit when there’s local supervision, rather than county or state, because it doesn’t happen as regularly. The Education Code requires the authority to visit each charter school at least annually. While the state sets the minimum requirements on charter oversight, it’s up to each governing board to decide what level of oversight they would like to exercise, according to Alleyne. How do other outside dollars in school board races influence the district? Most people who showed up at the public hearing for Rocketship charter petition were teachers and parents from Lake and Bayview elementary, two district schools a few blocks away from each other. According to Jones, people attended the hearing for fear that Rocketship, if approved by the district, can potentially share facilities with, or even displace, one of these two schools. “We all know that under current California charter law, they can easily be displaced by this Rocketship,” Jones said. She was referring to Proposition 39, a statute introduced in 2000 that requires school districts to offer all charter schools “reasonably equivalent” facilities that can accommodate all of their in-district students. However, Rocketship hasn’t filed a Proposition 39 facilities request by the November 1 deadline, and considering the 2019/20 start year in the charter petition, if the school decides to ask for facilities once the petition gets approved, it will not be until November 2018, according to associate superintendent Lisa LeBlanc. The district has not displaced an entire school of students in order to house a charter school so far. According to Delgado, only three out of the twelve charter schools are sharing facilities with district schools. Although Proposition 39 made it a requirement for the district to house charter schools, some charters in West Contra Costa are self-sufficient when it comes to facilities. This is another way outside investments impact the district’s operation. Making Waves Academy, one of the three district charter schools supervised by the county, opened in 2007 with the small campus built entirely with private donations, according to Steve Roth, chief operating officer of Making Waves Foundation. Earlier this year, the Contra Costa County Board of Supervisors approved $45 million in private bond to expand the campus of Making Waves Academy. John Scully chairs and is founder of Making Waves Foundation, the nonprofit organization that provides financial support for the Academy. Last year, Scully also contributed about $836,000 and $7,000 to the CCSA Advocates’ Independent Expenditure Committee and Charter Schools PAC respectively during the election cycle. Steve and Susan Chamberlin founded the Chamberlin Family Foundation in 2006, which has contributed more than $4 million toward programs and community organizations in the district, according to Singer. About $33 million was spent on building the Hilltop campus that houses the two Aspire charter schools and Summit Tamalpais. Although the district has the obligation to offer facilities to charter schools under Proposition 39, charter schools don’t have to use district space. “It’s helpful to the district in that we don’t have to provide facilities if he does,” Delgado said. The West Contra Costa school board will undergo major change one year from now as Cuevas, Block and Kronenberg entering the last year of their four-year term now, leaving three seats available by next December. Two new charters, Voices College-Bound Language Academy and Invictus Academy of Richmond, will be added to the charter school roster next fall. Reviewing new petitions and supervising the 14 charter schools in the district will remain as important topics for incoming board members to consider impartially regardless of how much money or services those three seats will eventually cost.